When flying, my nose is always pressed against the window of the plane. And on this trip to New York City, although it was far from being my first, I even bumped my head on the glass while trying to catch a better glimpse of that famous skyline. As we banked over the Atlantic Ocean in approach to the airport, I contemplated the grey, deep, ominous water. I want to love the Atlantic as much as I love the Pacific and Indian Oceans, but the water seems so uninviting in comparison. The sun doesn't set over the water here. There's none of the shimmering, dancing light that I treasure of a golden Pacific sunset. They say, "wherever you go, there you are." When I’m down South, I’m aware of my non-Southernness. “Do you have anything vegan?” “Piggly Wiggly is a what?” In Hawaii, I’m reminded of the power of nature, and of how I'd like to be a little more laid back. I can bravely walk towards a lava flow, but the closer I get, the less brave I become. When I'm on the East coast, I feel truly Californian. The entire Atlantic coast of the USA, and especially NYC, holds up a mirror in a way that no other part of the world does for me. I forget just how “West Coast" I really am until I make the journey back East. Yes, I say “dude” and “awesome”. And, it doesn’t go unnoticed in Manhattan. Dude, I need the awesomeness of nature and open space. Sigh, I love New York but I’m a Cali Girl. I can never get my bearings in New York, either. In mid-town Manhattan, it’s hard to use the sun for direction. With all the reflections and shadows from the tall buildings, you can’t just look up to tell time. Like all yogis, once I get my hotel confirmed, I immediately look for the closest hatha yoga studio. 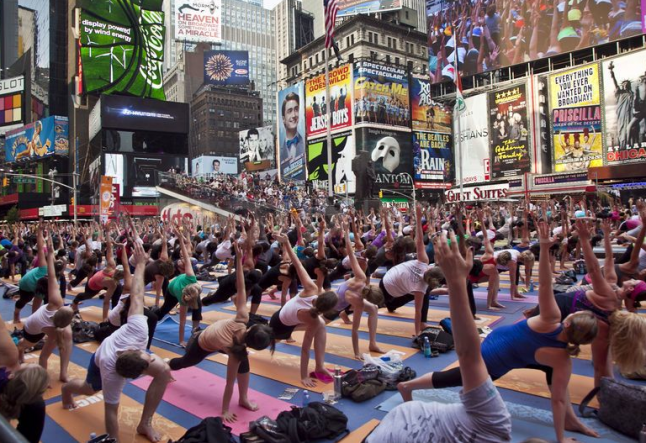 Yoga Works offered several choices--Upper East Side, Upper West Side, Soho, etc. I was determined to avoid Soho and being one of a million other tourists. So on the first morning after arrival, I tried YogaWorks on the West Side to help fight off jetlag. No matter what, I’m up before 6am by the clock. The clock said 6:00, my body knew it was 3:00, but I was awake. A level 1 class would be best. Taking the subway to get to a hatha yoga class is not a “California” thing. On the West Coast, you walk, you cycle, or you drive. The reality of how long it takes me to buy a subway ticket reminded me that, yes, I am a tourist. The building was classic New York: too many layers of paint, a slow and shaky elevator, and a feeling of history. The architecture in New York City has seen things. The studio set up was nice. The retail space wasn’t overwhelming. The greeters were quintessential city gals--smart, helpful and to the point. The class was perfect. The teacher was new to teaching but obviously well trained. I was even able to hold onto my hatha yoga buzz on the train back to the hotel. I only had one more chance for hatha yoga before I had to leave. Well, actually, it was two chances, but finally jetlag - okay, and a late night out in the City that never sleeps - caught up with me. I was becoming more New York every day! I planned to visit the Upper East Side. I really wanted to hear, face to face, why an Ashtanga class was being offered on Saturday mornings. Sacrilege! But, I saw a familiar name when I looked at the Soho YogaWorks schedule: Sherman Morris. Memories from my early days of practice in San Francisco in the 90's came flooding back. There were hundreds of people in almost every class at my regular studio, It's Yoga. Larry Schultz, the late and legendary founder, had an answer for everything: Do more Yoga! Back in the day, when Sherman Morris had just finished his teacher training, Larry threw him in front of the room, without warning, to lead class. I remember looking around the room, seeing all the smiles, and feeling full support from every student. We all wanted Sherman to succeed. And he did. So, I’m in the subway, buying another Metrocard to get to the Soho studio. This Yoga Works was in another characteristic New York building with steep, narrow stairs, too much paint and on-point staff. The loaner mat smelled like tea tree oil-awesome! I quietly found an anonymous space in the back, next to a window and waited for class to begin. The class was wild and fast, just like I remembered. I could imagine Larry's spirit loitering outside the window, nodding in approval. I took off my teaching hat and flowed with presence. Somewhere in the middle of Surya Namaskara B, Sherman stood in front of me as I rose up to Virabhdrasana A. We smiled and the class continued. We had a chance to catch up after class and I learned that a Californian can not only survive, but also thrive in New York. And, the world doesn’t end if you can’t see the sun set over the Pacific every day.